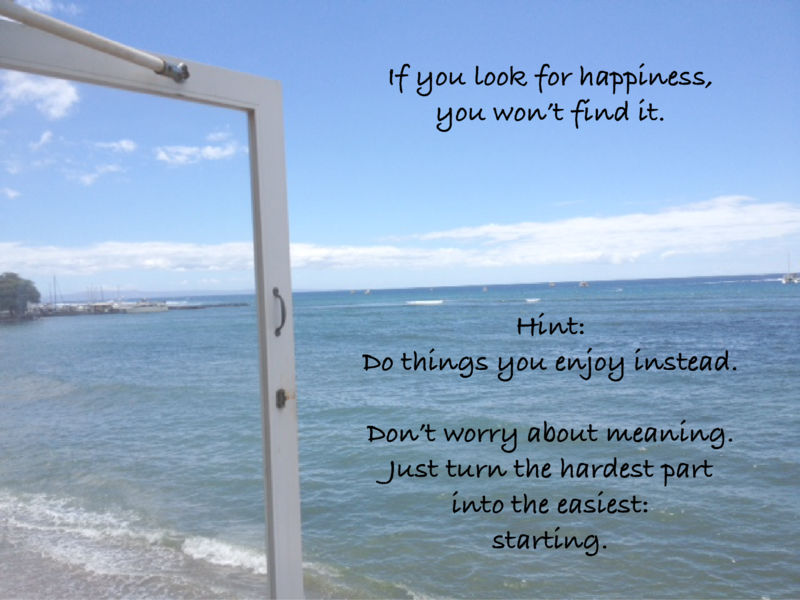 What is happiness? There are dozens of definitions and interpretations from your family, Webster Dictionary, your local religious leader, or coffee house philosopher. Happiness is not one absolute. Happiness is not a string of arbitrary, self-centric examples or a list of self-referencing synonyms. Think of happiness as a spectrum. Happiness is like the color spectrum. It’s a range that melds and transforms as much as people wax and wane over their lifetime. Let’s begin with a Baseline Wipe to reboot popular opinions. Joy: often confused with happiness. Happiness: the most commonly sought idea around the world, but often mangled in its obtainment. Contentment: an under discussed concept, yet offers the most lasting strength. Now, let’s apply the fresh Happiness Spectrum. 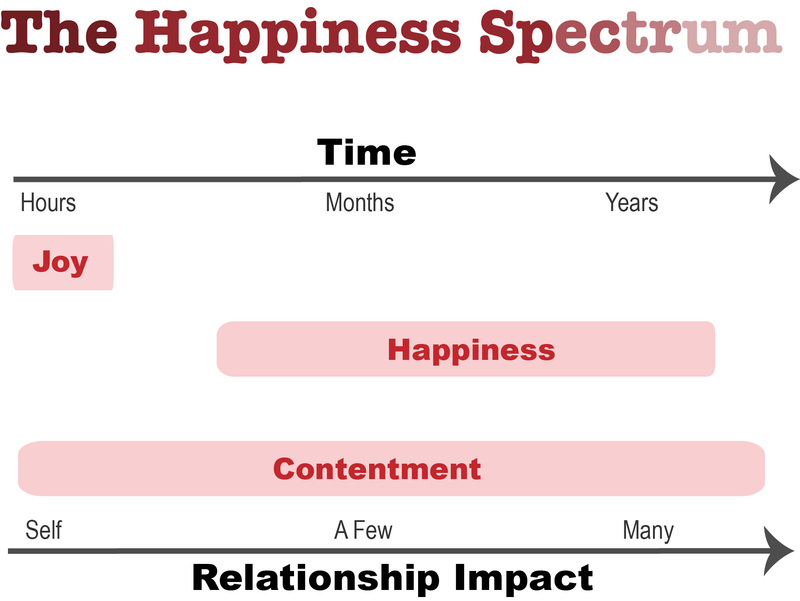 The Happiness Spectrum has two simple guides: time and impact to relationships. Joy: a good feeling lasting a few minutes or hours that mainly pertains to you individually. Joy occurs the most frequently in a day: a beautiful sunset passes, your favorite song plays, or getting new shoes. Happiness: a positive emotional state lasting a few months or years that involves a handful of key people in your life. You’re no longer alone in your action and the impact amps up in terms of commitments to important people in your life. Getting into your top college, landing that crucial job, or rearing a family with your love are examples with more complexity. There may be hard work, expenses or broken hearts with several people, while you figure out this elusive state called “happiness” that other thin, rich people with straight white teeth have so easily. The thrill of achieving these “important life milestones” wears off after a few months when you realize that you must continue to sustain and grow these delicate matters for an extended time. Thus, this is a common time when people have a radical mid-life crisis potentially involving divorce, a lifestyle makeover, or self-awakening. Whose dream are you really chasing and why is it worth it… hmm…? You may go on a spiritual quest or see a professional counselor to realize that happiness is not an end state, but a continuous journey. This happiness process takes bloody work through constant change that I cannot control 100%! Wait a Twitter minute. It turns out that everyone is making it up as they go along. Holy moly! This is actually quite liberating. This means that you can define, work, and share your happiness values within your own microcosm. Forrest Gump was happy mowing the high school lawn, jogging, and being a single parent. Contentment: takes place when one achieves the acceptance of either having or not having the desired thing. The amazing thing is that contentment can occur within you, with a few people, or with many people over any time period of life. Where is the cross-cultural dialog on contentment? No, contentment is not settling, selling out, or not having an opinion. Rather, contentment is when one confronts the 360-degress of a subject and makes peace with any result. It’s the “I’ll be fine no matter what” resolution. We break down the mind tricks we play on ourselves and finally unlock those emotional handcuffs by just letting go. In summary: Your dog excitedly greeting you brings joy, yet taking care of him for years brings both of you happiness, which you’re content to outlive him. A person flows and morphs in between joy, happiness, and contentment like a lava lamp. It’s mesmerizing to watch. Moreover, we just know it when we feel it, regardless of a definition.